← Planned Obsolescence, the intentional limiting of product lifespans, forces us to consume more than strictly necessary. With reference to energy saving light bulbs, is this a cynical ploy by the industrialists or a mechanism for maximising consumer choice? What is your “Political Compass”? Are you among the greats, a Leftie, Libertarian like Gandhi? This survey will tell all… maybe. Who do you, and perhaps more significantly, should you vote for? Are you firmly in the Left, as opposed to Right, wing of politics? Or, like me, do you swing both ways depending on the circumstance? Can you actually pigeon hole yourself anyway? Well, to make this possibility more of a reality, try this “Political Compass TM” test. In addition, I will examine the test’s validity and illustrate, by way of the controversial, Chilean, ex-President, Pinochet, how it’s hard to be truly subjective in such an emotive topic as defining one’s political persuasion. What is this new, proposed “Political Compass”? Are the survey’s questions appropriate? In general, I’m a bit sceptical of surveys… most are based on rocky and somewhat debatable assumptions. Well-designed surveys have an aura of their own and create a mystique of certainty around themselves. Thus, they can be more dangerous than useful, as poeple tend to take their conclusions as gospel when really they are only as good as the simplifications that defined them. It’s true, studies can be insightful, but at the same time it is wise to acknowlegde their limitations. The answer, obviously isn’t it peeps, is “Strongly disagree”? However, what is that telling us? I do believe in discipline. When the situation dictates, modern kids, especially, should be smacked more often by parents or headteachers. Discipline, though not necessarily Victorian in voracity, is learning civility to your fellow man. Kids need to learn and be reminded of that. It is not a purely innate behaviour. However, it doesn’t mean that all parents and all kids have to be smacked all or, even, any of the time. It’s not the “MOST important thing”, but nevertheless still an important tool in the parenting book. Thus, my “Strongly disagree” answer provided no information on my beliefs- a pointless question? I don’t believe all cultures are equal. Western culture is far more “civil” than north Ugandan, man-eating, rebel tribes. I don’t call them “savages” though – just idiots. My “Strongly disagree” answer does not mean I’m a progressive who believes that all cultures are equal. It’s just that we don’t patronisingly and disparagingly consider them “savages” these days. There are strengths and weaknesses in all cultures, vive la difference, however, some have more strengths than others. Once again, my “Strongly disagree” answer provided no information on my true, underlying beliefs. In general, the survey’s questions were not adequate to classify me as – a proud libertarian, who nevertheless still believes in personal, social responsibility. President Augusto Pinochet was no saint, agreed. It was likely that 2000-3500 were killed under his regime. But, comparatively, by Latin American standards, that is small fry. The number is actually remarkably low and he could lauded for succeeding in a complex, hostile, on the verge of communism environment with so few political executions. He was way better than the contemporary alternative: the all-controlling, self-serving, communist party of his predecessor, President Allende. Directly through Pinochet’s libertarian, free-market reforms in Chile he turned his Allende’s, 600% inflation, basket case economy into the only developed, OECD country in Latin America. The proof is in the pudding. With my nit-picking criticisms aside, I do actually like the survey and its premises. 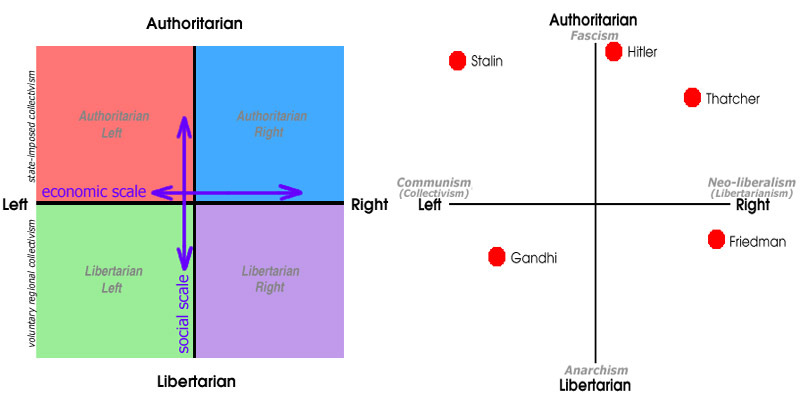 The 2D axis is more pertinent and descriptive than just calling someone Left or Right wing. It is a step in the right direction, but there’s perhaps a way to go with their biased and sometimes redundant implementation. In my arrogant opinion, they could have had half the questions and twice the effectiveness per each. Having read this far into my commentary, where would you put me? As you can see, we middle-class, university grad, Sydneysiders, aging from 25-55 are mostly Libertarian and perhaps a bit Left leaning. 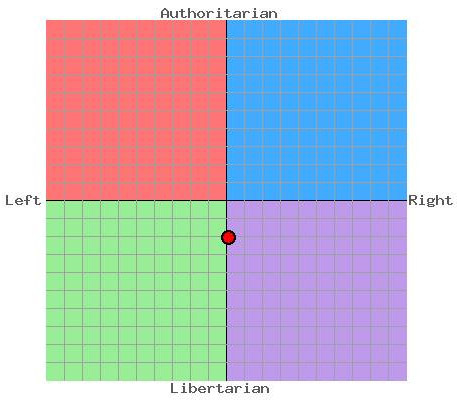 This entry was posted in Political Theory and tagged authoritarian vs libertarian, Chile, Cuba, left vs right wing, Political Compass, President Pinochet, survey, survey limitations. Bookmark the permalink. 16 Responses to What is your “Political Compass”? Are you among the greats, a Leftie, Libertarian like Gandhi? This survey will tell all… maybe. I tried this survey last night and it is very close to yours. I am curious though! Tonight I want to do the survey again and this time fill it like a typical Iranian Hezbollah might do (I would know – I was practically one, 25 years ago) and see how much of a difference is shown. Agreed. Ken Wilber beautifully and scientifically explains why this is the case and what the distinction is. Agreed. Alan Watts explains how in Japanese Zen, the master regularly beats up adult students with a stick. There is an evolutionary characteristic about the human neural network where it is programmed much more effectively with physical feedback than with verbal alone. In almost all accounts of spiritual teachings we encounter the (adult) student experiencing harsh physical contact by the teacher at certain points in the training. All, in all, it turns out I am quite balanced (wow, who knew? 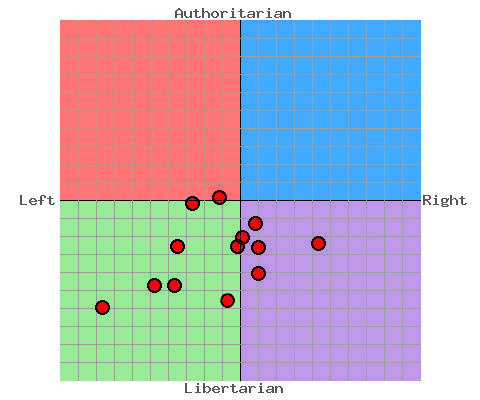 ), leaning somewhat more libertarian than authoritarian. Cower before me, peasants, for I am ……erm… Gandhi, it seems. I wonder if this accurately represents my dim, cynical view of humanity. Maybe I’ve gone so far up the scale that I’ve come out the other end. e.g. taking the warning labels off everything and letting nature take its course. If you agree that government will take some of your rights and give you sometime low level of life then you are “left”. If you younger than 35 – usually you are “left” and liberal. If you older than 55 and you are in middle or high social class – usually you are “right”. But names of parties never explain their real goals. There were different types of “left” in different situations. True, but Stalin was Left/Authoritarian, whiles hippies were either Left/Libertarian (living on benefits, but otherwise minding their own business) or Right/Libertarian (self-supporting, and just doing their own thing). Hippies generally were anti-government, whereas the left is usually all about government. Interestingly, the rise of the hippies was during the 1960’s at a time when the US government was in the process of some of the greatest social engineering of the 21st century (under Lyndon Johnson, one of the most left-leaning presidents in US history (the four big ones were Franklin Roosevelt, Lyndon Johnson, Jimmy Carter and Barrack Obama. Interestingly, Johnson and Carter were only elected for single terms, and that is almost certainly going to be the case for Obama as well). It was a period of increasing government power, which hippies generally opposed, unlike Stalin. Economically however, their views were typically left-wing, as they didn’t like to support themselves. A comment on my own results – while generally a Libertarian, I also usually have no great problem with authority. My issue is with mis-used authority…..like the parking ticket I got last night while (I believe, and will recheck this weekend) being legally parked. That is abuse of power, and while even small scale, is fundamentally wrong. The difference tends to be this: Progressives (Left wing) want to make the world a better place (stop global warming, save the environment, help the poor and disadvantaged et cetera, et cetera, et hoc genus omne. Conservatives (Right wing), who oppose them, therefore don’t want those things, which doesn’t make sense – who doesn’t want to make the world a better place, or to ensure its survival? Ergo Progressives think Conservatives are evil. Conservatives on the other hand look at Progressives, and regard their actions and simplistic and naïve – actions which lead to the opposite to what they want. They see Progressives as being motivated by wanting to feel good about their actions, and not actually being concerned about the real consequences of their actions. Tax policies are a good example – Progressives want to spend other people’s money for their bad ideas – the other people’s money largely coming from Conservatives. Ergo Conservatives see Progressives as stupid. The Progressive MSM (mainstream media) sees itself as fighting evil Conservatives, which is an emotional level far deeper that the Conservatives contempt of stupid progressives. The biggest bias in the press however is not the slant of the stories, it is the omission of stories. Republican Nixon gets hounded from office over the silly Watergate break-in and cover up, while the MSM almost completely ignore operation “Fast & Furious” which has resulted in hundreds of (Mexican) deaths from guns purposely sold to drug cartels by US government Justice Dept agencies – and the cover up has been occurring in the full sight of a mostly silent press. In any context, this is a huge story, and it is all out there – except in the MSM. The problem for the MSM is that each year, it becomes increasingly less of the gatekeeper to the news the public receives. At this point however, its ability to influence and ignore news it doesn’t like is very significant. Another aspect is the co-ordination of news – and Journolist was proof positive that all the major MSM organisations have actively co-ordinated news stories and press narratives with the Democratic Party for many years. That’s why stories derogative of Republicans (take the instant campaign against Palin as a good example) can appear overnight on such a wide front. •	The European tyranny-by-clerk, which needs global warming to be a problem because it can then arrogate yet more centralizing powers to itself, yea, even unto the last fluorescent light-bulb. The EU will sign anything, because the unelected Kommissars who have the sole right to propose its laws do not have to care what the people think, and they want more central power in their hands. They are also advising the envious UN on how to grab all political power by stealth – a treaty here, a treaty there until suddenly democracy has been stolen away forever. •	The BRICS bloc – Brazil, Russia, India, China, and South Africa – which is not really a bloc at all. All of these emerging nations cannot afford to allow the vicious policies of the anti-development Greens to interfere with their mission to expand the use of fossil fuels to give their people affordable electricity, lift them out of poverty, and thus benefit the environment by stabilizing their populations. 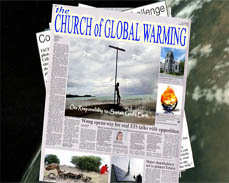 They will sign any treaty that does not bind them to limit their emissions. •	The fly-specks: The small island states and other economically tiny nations in the undeveloped world. Their ambition is to extract as much money from the wealthy West as they can get. •	The unfooled: Canada, Japan, and New Zealand, who have stayed clear of the now-defunct Kyoto Protocol, which will unavoidably expire December 31 because there was no agreement to extend it by October 3, as its own terms require. •	The fools: In this category, Australia stands alone. Its absurd carbon dioxide tax is almost 50 times more expensive than letting global warming happen and adapting in a focused way to its consequences. •	The United States: Also in a category of its own, Obama’s U.S. is a house deeply divided. The “Democrats” – more like Communists these days – will do whatever it takes to destroy all (such as fossil-fuel corporations) who fund their Republican opponents. Also, they will sign any treaty calculated to wreck the economy of the West. The Republicans, however, will not. No climate treaty will be agreed to by the U.S. Senate, where Senators Inhofe, Hatch, Vitter, and others have spoken out clearly and consistently against climate-extremism. That pretty much sums up how I see it on this matter – except I’d add a big driver has been the cynical use of the global warming issue as a very effective political wedge issue which has kept conservatives off-balance for quite a few years (in fact I would argue this is the main reason this issue has gained such purchase amongst politicians ie as opposed to Euro bureaucrats). I see that political use fast coming to an end, as rising costs and cynicism (those sea levels are stubbornly not rising as promised, and the “real” science increasingly catches up) make the issue a political negative. The new wedge issues of the political left are women’s rights and abortion (although these will have a much shorter shelf life as issues), and with a replacement issue(s), global warming is now increasingly redundant as a political issue. Reminds me of the saying of Szent-Gyorgi: And if everybody says that you are wrong, then you are one step ahead. But there is one situation which is better still, when everyone begins to laugh about you, then you know you are two steps ahead.